Celebrate your anniversary or wish a couple you know for their anniversary with this thoughtful gift. We have chosen germinis, stallion chrysanthemums, veronica, avalanche roses and agapanthus for this bouquet. Large 18&apos; Helium Balloon included. Our florists have chosen each stem with the utmost of care and hand tied these beauties with raffia for the ideal presentation. 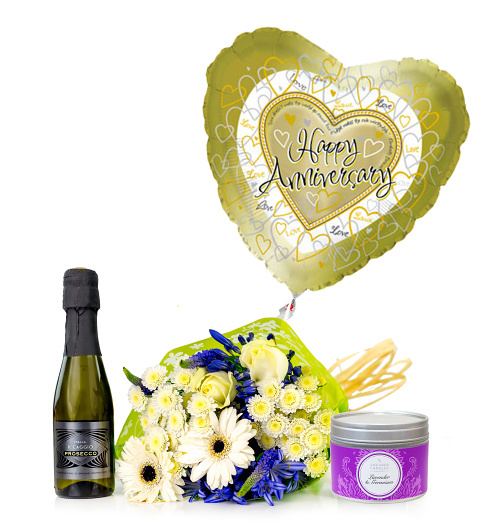 Accompanying this stunning bouquet, you will receive a bottle of Prosecco, a Happy Anniversary helium balloon and a fragranced candle! Available for UK next day delivery, this is a thoughtful gift that you can depend on!